As mentioned, I grew-up in northern New Jersey, which was the "cradle of technology" at the time. From Edison's lightbulb (Menlo Pk) to transistor (Bell Labs), and audion (Jersey City), I lived in the region where it all happened. Since I was a kid, I always heard the name DuMont. Probably due to the fact that my parents purchased a DuMont set in 1957. And a local TV serviceman kept it going until its demise (picture tube failure) in 1969. 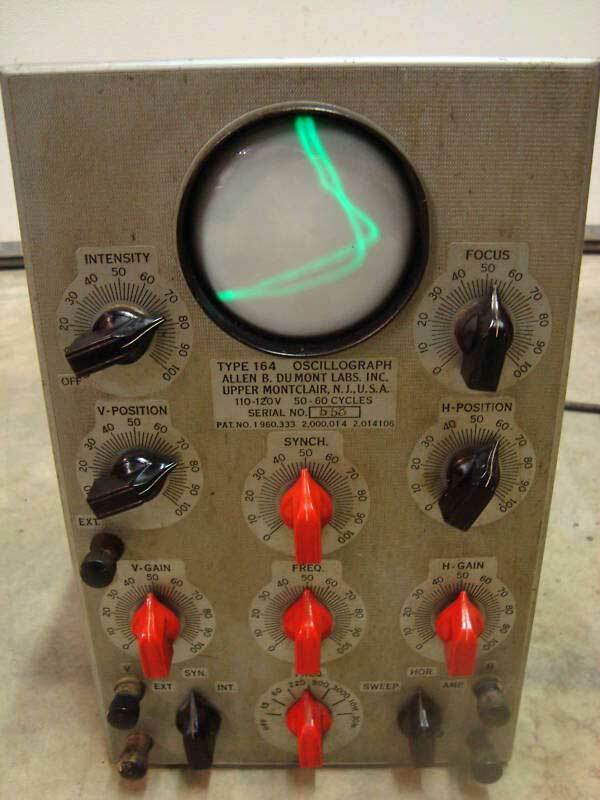 Inspired by that TV serviceman and electronics of the era, I chose my future career path in electrical engineering. Since 2nd grade, I commenced to build science-fair projects using Alfred Morgan's (from Montclair, New Jersey) "Boy's Book Of Electronics" series. Speaking of Montclair, the nicely wooded town was 8 miles from my original home in the Meadowlands. The famous landmark nearby today is MetLife Giants football stadium. Allan Balcomb DuMont was a man of means. He grew-up in a palatial residence on Bradford Way, Upper Montclair, New Jersey (I've been there). His laboratory works were directly adjacent. It was in that lab the magic eye tube was developed by ABD, to provide funding for his CRT television research. 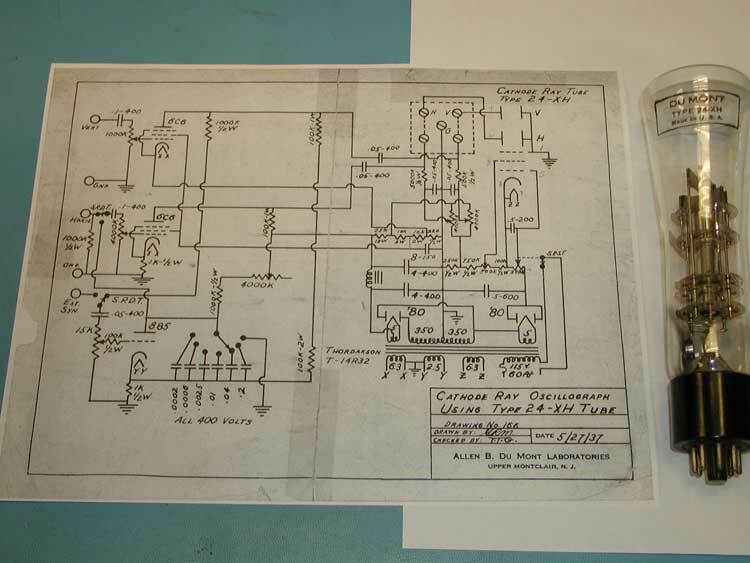 The above photo shows an early 2" CRT from Upper Montclair, part of my private museum collection. I also have the 3" and 5" clear versions, plus a rare pre-WW2 Teletron white phosphor clear-glass CRT. Outgrowing his labs, DuMont's first retail location was on 532 Valley Road in Upper Montclair. (I've been to that location too). There is a historic marker sign, but the original building has been removed. Shown above is a DuMont 164 scope from that location, in my collection. The next expansion was to 2 Main Avenue, Passaic, and then to 1000 Main Street, Clifton. 1000 Main Street stands today, a nice brick 4 story structure used for storage. DuMont's scopes,TVs,and CRTs were made there and at two more locations; Bloomfield Ave in Clifton and at East Paterson, where TV sets were manufactured shortly before the DuMont-Fairchild company went out of business . The Bloomfield Avenue location was the later site of a Thomson-CSF CRT factory and Duro-Test Lighting Corp. Both are now gone, demolished as part of Superfund cleanup/reclamation. The East Patterson location is now Elmwood Park and the original site of Marcal Paper Products. 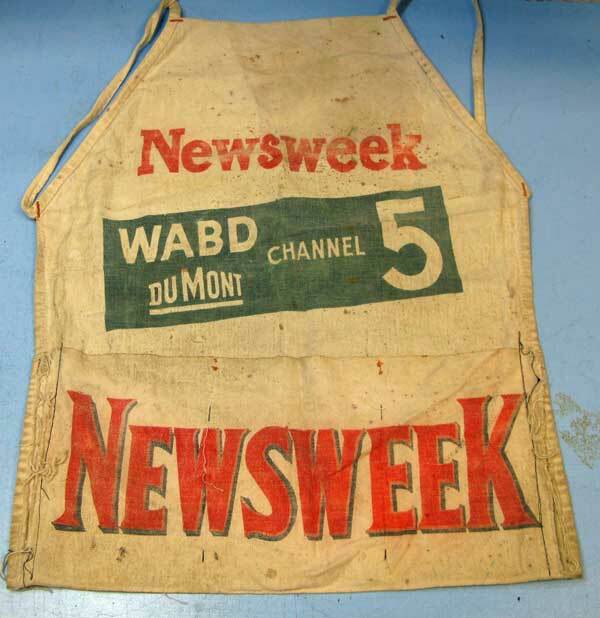 This is the original newsboy's apron which my dad used when woodworking in New Jersey, with the WABD Channel 5 logo clearly visible. WABD later became WNEW and then WNYW Fox 5 in New York City. Honeymooner's TV episodes were first broadcast in 1955 over WABD, using the innovative "ElectroniCam" process. Mr. DuMont is interred in Mount Hebron Cemetery in Montclair, About 1.5 miles away where it all began in the 1930's. Remember his legacy each time you view a program, either on a vintage TV set (hopefully) or a modern HDTV.